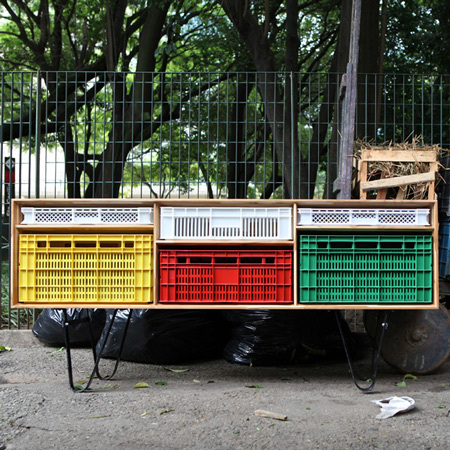 Brazilian designer Mauricio Arruda has designed a collection of storage units that house ubiquitous plastic crates. Called José Collection, the crates are made of recycled plastic and slot neatly into specially-made wooden frames with steel legs. The crates could still be used as a means of transporting goods, minimising the use of cardboard boxes and plastic bags. The JOSE COLLECTION is a family of storage furniture produced with materials and processes that are less harmful to the environment and society. The development of the collection analyzed the product life cycle: from the materials used to the manufacturing process and the furniture's use to its recyclability, in order to minimize the environmental and social impact, and the waste of raw materials and energy. The project accounted for the amount of residues produced in the manufacturing of the furniture. The size and measures of each product were defined to achieve an optimal use of wood and generate the minimum amount of waste. The plastic containers are made from recycled plastic through a process that is already incorporated in the manufacturer's production line. The furniture base is made from cut carbon steel bars that are bent and receive an anti-corrosion coat and an automobile paint. The solid wooden sheets carry the FSC (Forest Stewardship Council) environmental certificate seal. Forest certification ensures that the wood used in furniture comes from an environmentally correct, socially fair and economically viable production. The wooden sheets are treated with natural carnauba wax, without the use of solvent-based finishes. The JOSE COLLECTION is inspired in the traditional street markets and open-air fairs in Brazil. The informal and transitory look of these spaces gave rise to the wooden structures that have a light and simple design and store colorful and removable plastic containers. The design of the steel base is reminiscent of the carts used by the collectors of paper and recyclable trash and the merchants themselves. The furniture's design suggests a multi-purpose functionality. The plastic containers can be removed from the units, allowing people to store and transport objects, toys, food, clothing, books, bottles etc., both indoors and outdoors. Groceries can be taken from the supermarket to the home without the use of plastic bags. The containers are also stackable and can be reorganized away from the shelving unit, according to the user's needs. The result is a line of environmentally conscientious furniture with real Brazilian identity, marked by simplicity in its form and function. Mauricio Arruda graduated at the Architecture and Urban Planning State University of Londrina, Paraná, Brazil (Universidade Estadual de Londrina/UEL) in 1997 and was granted a master degree at Sao Carlos State University in 2000. Mauricio has participated as a Latin America fellow-author at the creation of the Agenda 21 for Sustainable Construction in Developing Countries and has conducted several researches in the residential and environmental fields. Interior Design professor since 2001, has lectured in many Brazilian educational institutions, i.e. SENAC, Escola Panamericana de Arte. Currently teaching at the IED Brazilian branch – Instituto Europeo di Design. As a professional architect Mauricio develops and manages projects for residential and commercial spaces as well as product design. Along with former university colleagues Guto Requena and Tatiana Sakurai, Mauricio created the creative collective WHYDESIGN.